FeeX is an SEC-registered investment advisor that analyzes investment fees for investors. Its purpose is to bring transparency to fees and help investors save on investment costs associated with brokerage accounts, advisor-managed accounts, self-directed IRAs, and 401(k) accounts. After evaluating fees associated with investments, accounts, and advisory relationships, FeeX suggests low-fee alternatives in sync with an investor's current strategy. The firm projects potential cost savings associated with lower fees and urges the investor to take action. A few robo-type advisory firms offer similar services. What makes FeeX different is its focus on fees. Other advisors may offer recommendations that mix investment guidance and fee evaluation; for example, I've received advice to sell stocks and buy mutual funds, which would raise my fees. FeeX does provide a list of lower-fee investments similar to existing holdings if available. The firm identifies similar investments based on characteristics such as investment category, allocation, and strategy. These comparisons are among mutual funds and ETFs, not individual stocks. Another innovative feature of FeeX is the reporting of fees and their impact on account balances over a long period of time. I've seen illustrations depicting the general impact of investment fees but having a personalized illustration with actionable advice is more meaningful. To use this service, sign up for an account and then link investment accounts to FeeX's system. Provide login credentials for investment accounts and the firm automatically populates its system with individual information; or enter data manually. This process is similar to those of Personal Capital, SigFig, FutureAdvisor, and WealthFront. If an investor pays an advisory fee not reflected in account statements (charged separately from brokerage fees), this information can be added (using checkboxes) to indicate how these fees are calculated and which accounts are managed. Using this information, an investor can make decisions on what funds to consider keeping and which ones to consider replacing. The firm uses bank-level encryption when accessing information and requires authorization to move money or make changes to an account. FeeX offers a few more services in addition to its fee analysis tool. A new one is a concierge service that facilitates 401(k) to IRA rollovers after analyzing whether a rollover may be in your best interest in terms of fees. This service is free for a limited time. The Investment Test Drive tool allows to quick evaluation of fund expenses. This data may be useful in choosing funds with low fees rather than fixing problems after the fact. The chart also indicates the fund's investment category (in this case, “large growth” referencing large-cap stocks oriented toward growth); asset allocation among stocks, bonds, cash, and other; and a description of each fund's investment philosophy. I've compared funds on my own using brokerage firm's comparison tools or a spreadsheet but I really liked how fast, easy, and simple yet thorough this chart presented information. I'll definitely refer to this tool when making future fund investing decisions. Investors who rely on advisors to recommend fund picks may be interested in this tool, which can present low-cost alternatives to high-fee funds. Another tool accessible from the dashboard is Insights. Here I can find illustrations of total fees over time whereas other graphics show how much I could save by switching to a lower-cost investment. For example, I learned that I'll pay about $4,700 in fees over the next 12 years with my current portfolio, which is a low-fee one; switching one of my mutual funds to a low-cost fund saves me about $1,000 over those 12 years. This information tells me that it's difficult to avoid fees altogether; so instead of eliminating fees, I need to focus on getting what I need at the best price. Using FeeX was easy and intuitive. I followed prompts to link my accounts; FeeX found my IRAs on the first day and on the next, located and brought in my regular brokerage account and my retirement accounts. I tried to link one of robo-advisor accounts but initially received a message indicating a technical difficulty at this advisor and letting me know I should receive clarification within 24 hours. (I checked my account directly but saw no problems so there must have been a glitch in the linkup, not the account itself.) Within a day, FeeX had connected with this account. One of my accounts holds stocks, which — unless you trade frequently — can be the ultimate low-fee investments. FeeX located no fees for this account. For my account with mutual funds and ETFs, FeeX identified one fund with a lower-cost alternative. A couple Vanguard-brand funds were classified as low fee and the rest didn't have similar alternatives. The firm offered to switch funds (sell my fund and buy a low-fee alternative) but also gave instructions for making the change on my own. The do-it-yourself instructions were clear. However, there wasn't an emphasis on transaction fees and tax implications but more of a focus on selling high-fee funds and replacing them with low-fee ones. I like to consider transaction fees and tax implications before I make trading moves. Here's why: I might hold a no-load, no-transaction-fee mutual fund that must be held more than 180 days to avoid short-term redemption fees. So, if I had purchased the fund a month ago (30 days! ), then my account could be dinged with a fairly significant charge (say $49.95 for cashing out early). Further, if I had bought the fund recently for a regular brokerage account, then this move may trigger short-term capital gains tax. Still, if the fee is high (say, I'm paying $100 annually for the fund) and the investment is held inside an IRA, then switching may make more sense. But I'd consider looking at the holding period for fees and taxes before selling, not after — when it's too late to avoid negative consequences. Regarding the robo-advisory account, FeeX confirmed the advisor's claim that my money is invested in low-fee ETFs. It also correctly labeled this account as a managed account and projected its cost as $598 over 12 years. FeeX analyzes account statements and investments to identify fees. The firm also allows me to send fee disclosures for a lengthier evaluation. Many investors may find that FeeX is useful to get clarity on investment fees. Retirement savers of all ages may be able to glean insights regarding retirement account fees. This information could help decide among a private-sector IRA, an employer's 401(k) or other retirement plan, or an IRA rollover based on fees relating to account management and investment choices. Investors in the process of building a fund portfolio or evaluating advisor recommendations can analyze fees (including sales loads and advisory fees) before buying funds. Retirement savers and investors pay fees for various reasons, such as the desire to outsource investing decisions to traditional or robo-advisors. 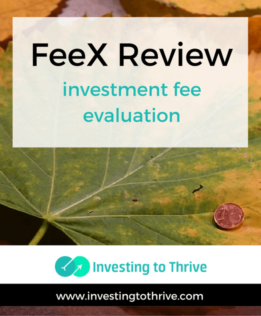 The point of FeeX is to bring the type and amount of fees to the surface, show their long-term impact on net worth, identify low-cost investment substitutes, and offer guidance on creating and maintaining a low-fee portfolio.